Bitdefender Archives - Symtrex Inc.
SyncCrypt was detected by Emisoft researcher xXToffeeXx, reported Bleeping Computer, and is spread via spam emails containing an attachment with .wsf (Windows Script File) files. What is unusual about this, other than a .wsf file being used – which is rare – said Bleeping Computer founder Lawrence Abrams, is the .wsf will download an image with embedded .zip files containing the ransomware. “This method has also made the images undetectable by almost all antivirus vendors on VirusTotal,” Abrams said. However, whether or not the image is opened the .zip file is downloaded and its contents, a sync.exe, readme.html and readme.png, are extracted, Abrams said. The good news is that while image file tends to pass through most antivirus files contained inside the .zip file are more susceptible to detection. Although Bleeping Computer found that VirusTotal still detected them less than 50 percent of the time. If properly installed the files are encrypted with a .kk extension and then the ransom note appears giving the victim 48 hours to pay about 0.1 bitcoin. At this time there is no way to decrypt the files and the best defense is to ensure all files are properly backed up. Ransomware has been around for a few years but has become an albatross around everyone’s neck—from big businesses and financial institutions to hospitals and individuals worldwide—with cyber criminals making millions of dollars. 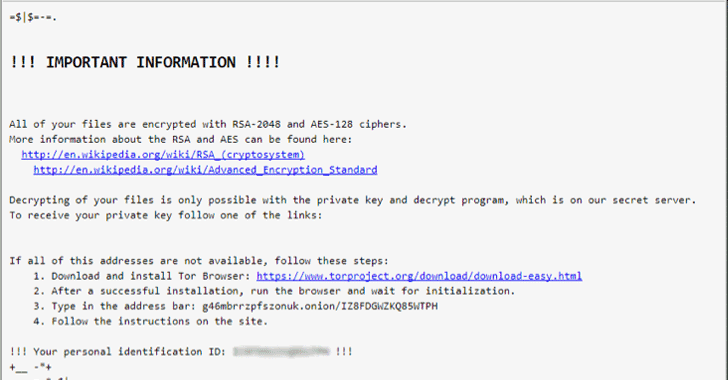 By tricking victims into clicking on a malicious attachment, Locky ransomware encrypts nearly all file formats on a victim’s computer and network and unlocks them until the ransom in Bitcoins is paid to attackers. Finding the best endpoint security for your enterprise is a complex, ever-changing task. Learn what features tools offer now to protect endpoints touching the enterprise systems. When McAfee was formed in 1987 to sell the first commercial antivirus package, it set a baseline approach that has persisted to this day: Have a list of character strings that are unique to particular viruses and then scan files (and those files in memory) for the strings. Generally, if the scanner found one of the strings (the virus’s signature), it had very probably found a virus. As other vendors emerged, they battled over their effectiveness at various aspects of this passive scanning approach. They focused on compiling the biggest, most comprehensive database of virus and malware signatures. The best endpoint security software available simply scanned for “bad” signatures every time a file was downloaded or opened. We use custom software development services so we know we’re getting the best software that we need for our business. Vendors would boast about having better research teams to catch more viruses. A number of additional virus-hunting techniques were introduced over the years — heuristic scanning to deal with polymorphic viruses that purposefully avoided having consistently scannable signatures, allowing the software to run but cordoning off its requests to the operating system to watch for malicious behaviors, and the introduction of reputation-based ratings to score the likelihood that a given executable could be relied on to be safe. But the basic pattern held: A monolithic software package at the endpoint watched all the new files and called out known bad actors. Recently, though, the enhancements have begun to overtake the core static scanning components of antivirus software. “Next-gen” endpoint security tools have emerged as a new product category with specific characteristics. Signature files are static and threats are dynamic. At a certain point, it simply became impractical (if not impossible) to update signature files incessantly and instantaneously in an attempt to contend with zero-day threats. These are by definition threats that no virus collector has yet catalogued as of the moment they are launched. So, if anything, “real-time” is the defining characteristic of the best endpoint security offerings in the next generation of tools. For many products, this means jettisoning the endpoint-resident signature file altogether and using different means to ferret out viruses and malware. In next-gen tools, the best endpoint security offerings replace signature matching with analysis (in real-time, of course). Different products, naturally, will analyze different aspects and attributes to determine if a piece of code represents a threat to the endpoint. Some of the analysis techniques have evolved from traditional endpoint products. For example, reputation analysis has been in use for a number of years. This technique generally involves searching a database containing lists of known “bad actor” IP addresses and websites that have been confirmed to be sources of malware. For some traditional vendors, moving to next-gen tools means taking various techniques that they have developed over the years within their traditional product line and integrating to provide a more effective solution. Many security products will evaluate multiple attributes of a piece of code. Each piece of information would be used to build a risk score that, ultimately, would help the tool determine whether the code should be blocked. One next-gen vendor claims to have developed over six million possible indicators of malware and uses that information to determine whether a given piece of code is malware. Another variation of analysis involves simply letting the suspect code run on your system, to analyze what it does. If it tries do something bad, like erase files or make outbound network contact without authorization, then by definition it is malware and should be contained. This approach, known generally as sandboxing, is not new. What is new is the implementation: One vendor leverages the high-performance virtualization features built into most PC hardware these days. That vendor creates a micro VM that can be termed a one-sample sandbox. The code is run, its behavior analyzed, a threat decision is made and the VM is discarded. Every sample gets its own fresh VM within which to run and be analyzed. In the realm of next-gen endpoint security, niche vendors are continually coming up with new takes on the issue. There are always new features being added. But it’s also important to understand what next-gen endpoint security is not. It is not a one-size-fits-all solution to your endpoint security woes. Nor is it a “me, too” list of vendors all doing the same thing. And, importantly it is not necessarily meant to be a total replacement for traditional endpoint security. It is simply a means to obtain the best endpoint security possible which is, in turn, a key element of an overall approach to keeping your systems secure. Insider sabotage – whether by a former employee who still has network access and is bent on sabotage or a careless staff member who clicks on phishing links when using company devices, or even a contractor or associate – can be particularly devastating because it’s usually not detected until the damage is done.